Need to share information quickly? 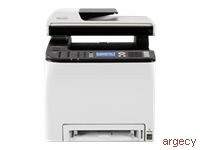 Copy, scan and fax with the RICOH SP C252SF Color Laser Multifunction Printer. Move efficiently from job to job with print speeds of up to 21 pages per minute (ppm), and dependably produce full-color or black-and-white output. Use the standard powerful 400 MHz controller and 256MB RAM to expedite multiple jobs and process large files quickly. Plus, use the 35-sheet Automatic Document Feeder (ADF) for faster scanning. Create high-quality color documents, even on a small-business budget. Produce documents with true 600 x 600 dpi, plus interpolated resolutions of up to 2400 x 600 dpi to meet high image-quality demands. For internal or draft documents, choose Economy Color Mode to print text at full density accompanied by lower-density images - using less toner and significantly reducing your cost-per-page. The compact desktop SP C252SF connects easily with secure IEEE 802.11b/g/n Wireless LAN connectivity, and features a compact design to fit virtually anywhere. Eschew physical limitations and locate the device to suit office traffic, or place it strategically to save space. It's also compatible with Windows and Apple technology, and supports PCL and PS3 emulation, as well as UNIX and Citrix utilities for distributed printing environments. Share information easily, no matter where you are. Engage the SD C252SF right from your smartphone, and use it as your mobile workstation for completing office tasks. Simply download the RICOH Smart Device Print&Scan app to capture and print documents right from your personal mobile device. Manage the SP C252SF with the touch of a button. From a conveniently located control panel, you can check supply status and adjust print jobs on the spot. If you're working remotely, you can manage printer network settings, see fleet utilizations and check consumable levels using the Web Image Monitor feature. And when toner is running low, you can quickly and easily change the top-loading, All-In-One (AIO) print cartridges to save time and reduce maintenance costs. Don't compromise your eco-friendly commitment. The SD C252SF meets EPEAT* Silver criteria, and is certified with the latest ENERGY STAR specifications. Save paper with features like automatic duplex printing, and cut energy use with the Energy Saver Timer. In addition, Ricoh's consumable and product recycling programs make it easy to recycle. *EPEAT is a global environmental rating system for electronic products. EPEAT Silver rating is applicable only in the U.S.A.